Well, if there’s one thing you can say, it’s that there’s something out there with a sense of humor. 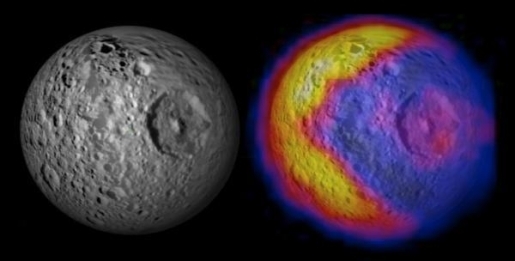 Why else would Mimas, one of Saturn’s moons, end up looking like Pac-Man eating a pellet? The scan, a temperature map of the planet conducted by NASA’s Cassini spacecraft, revealed the odd image on the icy planetoid during a series of scans of Saturn’s mostly-ignored moon. There are several possible explanations for the odd shape of the heat map; none of them mentioned are Pac-Man Fever sweeping the planet, but that’s my theory. “We suspect the temperatures are revealing differences in texture on the surface,” said John Spencer (sans Blues Explosion), a Cassini team member at Boulder, Colorado’s Southwest Research Institute. “It’s maybe something like the difference between old, dense snow and freshly fallen powder.” As it turns out, that frozen little rock is more interesting than scientists thought!